Wakefield Castrol oil change reminders. Homepage. This page: Two blotters designed to remind garage customers about regular oil changes for their car. 1. Oil change reminder from Castrol. Interesting odds and ends relating to motoring in the olden days turn up quite often still. 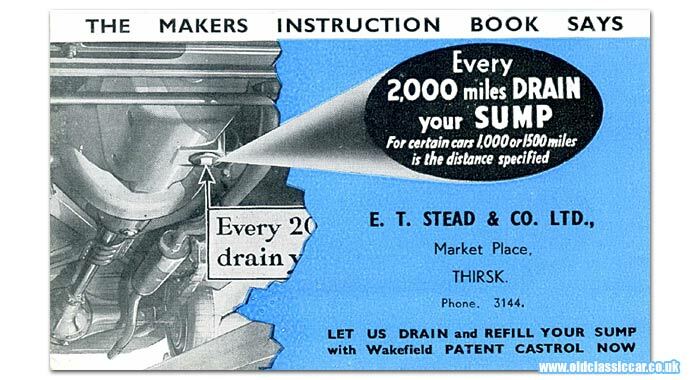 Shown below is a blotter produced by Castrol, the first of two on this page, and personalised with the address of one of their supplying outlets, in this case E.T. Stead & Co. Ltd of the Market Place, Thirsk. This would have been given out to customers of this garage, reminding them that regular oil changes at 1000, 1500 or 2000 mile intervals were recommended for their car, and that they also recommended Wakefield Castrol motor lubricant for the job. The illustration features the underside of a typical 1940s/1950s car. My guess is that this oil-change reminder dates to the early 1950s, certainly the RAC Handbook for 1949-1950 lists E.T. Stead & Co. Ltd as an "Agent" in Thirsk, alongside "Repairers" J. Bell & Son Ltd of York Rd, and Greens Garage (Thirsk) Ltd of Stockton Rd. The Handbooks for 1928-1929 and for 1959 also list the E.T. Stead garage as an RAC-Approved establishment, so evidently they were in business for a good period of time. I've looked at some period images of the Market Place, but have yet to find one showing this repair shop. 2. Another Wakefield Castrol blotter. This old blotter also dates to the 1940s or 1950s, and is of a simpler design to the example shown above. 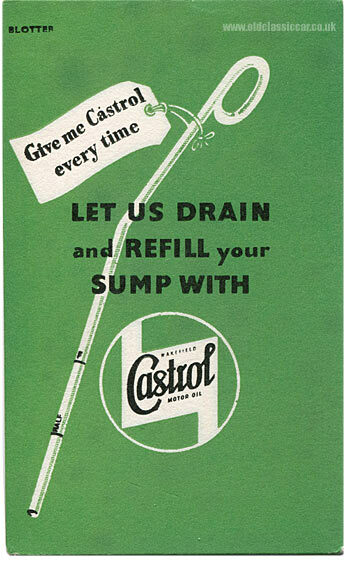 Rather than feature the underside of a typical saloon, it simply incorporates an illustration of an engine's dipstick, alongside the Wakefield Castrol oils logo, and the slogan "Give me Castrol every time". Unlike the blotter shown above, this green example isn't specific to a named garage, so could have been distributed via any company-approved outlet, whether it be a garage, engineer's workshop or car dealership. Return to the motoring collectables section, for other similar items, including another blotter but this time referring to Mobil Oils, rather than Castrol.